Purple Garnet (Ovl), Natural Cambodian Zircon Pendant in Platinum Overlay Sterling Silver 1.750 Ct.
GP Rhodolite Garnet (Ovl and Rnd ), White Topaz and Kanchanaburi Blue Sapphire Pendant in Rose Gold in Sterling Silver 9.500 Ct, Silver wt 7.90 Gms. Arizona Anthill Garnet (Rnd), Boi Ploi Black Spinel and Natural Cambodian Zircon Pendant in Platinum Overlay Sterling Silver 3.000 Ct. The luxuriously tasteful hues of pomegranate jewels can now be worn in bespoke class and posh fashion. The garnet pendants in our collection let you have a look at the sublime beauty in fancy designs. Take a look at the rich and blooming diversity that we have to offer and swathe in the stunning crimson goodness, only and exclusively with TJC. Topping the most lovable designs is our variety of cluster pendants. With the marvellous hue multiplied in swathing excellence, the pendants of this sort have a show-stopping allure and charisma. They have a carpeted feel with the luxury of sublime crimson colour. 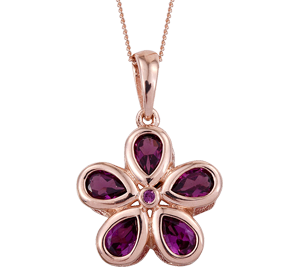 Another bestselling feature under our excellent category boasts of exquisite floral pendants. Studded with the transfixing crimson delight, these stunners are designed in cheery flowers. Adding a glorious element of colour, garnet marks the element of glamorous luxury in these pendants. Single-stone beauty is always transfixing. And if the colour is enriched and besotted, their presence is delightful. You can see similar magic unfurl with the luxurious garnet solitaire pendants. Flaunting their bold and stark enigma for everyone to see and appreciate, the solitaire pieces in our array win hearts and envy. The pendants we have offer boast of the stones straight from the mines. This assures and ensures the genuineness of the stone quality. Meaning that we provide you the best and famed collection of genuine garnet pendants with the best-available quality that one can ask for. We also pair the design with the purest metal choices. Some of our more revered lays are in gold in the tinges of yellow, white, and rose (9K, 14K, 18K,) platinum (950-grade,) silver, rhodium, and more. Another reason why you must select us is because we offer you slashed down prices. At TJC, we don’t have the need of middlemen, seeing as we source our gems straight from the mines. The absence of the said middlemen ensures we offer you a fleet of affordable garnet pendants in UK. However, our selection of garnet pendants isn’t all that we have to offer. We have an outstanding class and grade of the best rings, earrings, necklaces, bangles, and a lot more. You’re only a click away. Happy shopping!